Defenseman Josh Brown and forward Dryden Hunt each scored their first NHL goal as the host Florida Panthers defeated the Detroit Red Wings 6-1 on Sunday. It was the 33rd NHL game for Hunt, 23, who signed with the Panthers in 2016 after going undrafted. Brown, 25, was Florida's sixth-round pick in 2013, and this was his 24th NHL game. Hunt and Brown upstaged another Panthers rookie -- goalie Sam Montembeault, who had zero wins a couple of days ago but has now won two straight games after stopping 19 Wings shots. Against the Wings, the Panthers also got one goal and one assist each from Aleksander Barkov and Jonathan Huberdeau. Barkov leads Florida with 77 points and has a career-best 30 goals. Huberdeau has a career-best 74 points and leads Florida with 52 assists. The Panthers also got two assists each from defensemen Aaron Ekblad and MacKenzie Weegar. Detroit, which got a goal from Thomas Vanek, has lost 10 of its past 11 games. 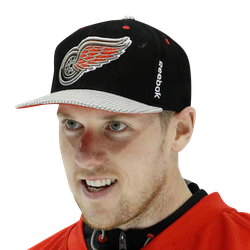 Wings goalie Jimmy Howard had a rough game, making 37 saves. Florida opened the scoring on Brown's goal with 6:42 expired in the first period. Troy Brouwer, who had the puck deep along the left boards, fired a centering pass to Brown, whose wobbly wrist shot beat Howard glove-side. Less than three minutes later, the Panthers scored again. Detroit's Madison Bowey was called for hooking Huberdeau, and the Panthers capitalized just 13 seconds later. Ekblad fired from the left circle, and Jamie McGinn whiffed on his first try at a rebound before finding the back of the net. The teams split scores in the second period. Frank Vatrano gave Florida a 3-0 lead when he redirected a pass from Ekblad. Vanek's power-play goal cut Detroit's deficit to 3-1. Frans Nielsen's cross ice pass led to Vanek's one-timer, and Montembeault couldn't get over to his right in time. From there, however, the Panthers scored three times in the first eight minutes of the third period, and the rout was on with those goals by Huberdeau, Hunt and Barkov.